De Dietrich glass-lined reactors have been at the heart of chemical operations for over a century. These are robustly designed and manufactured to stand up to very harsh environments. The (typically) carbon-steel shell is designed and built to ASME code and then lined internally with our proprietary 3009 Glass. 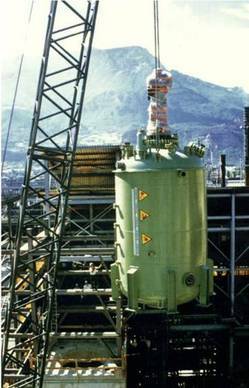 After the glassing operation is complete, the external jacket (HemiCoil) is attached, the reactor is pressure tested, painted and assembled for shipment. Glass-lined reactors are either custom fabricated or built to industry standards. 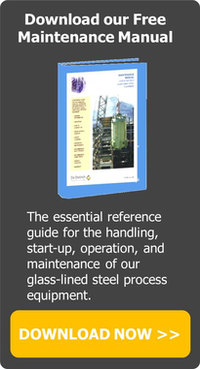 Learn more about the internal components of glass-lined steel reactors and the advantages of this construction. CTJ Series - clamped or flanged-top reactors designed with a removable top head for today’s cleanability demands. GL Series- closed-welded reactors without a large main opening to maximize top head strength and allow for higher pressure ratings. SA Series- rugged, heavyweight reactors with large top head main cover that allows for installation and removal of one-piece agitators. - a patented reactor design that optimizes the mixing performance of glass-lined reactors by integrating three baffles on the vessel wall. Glass-lined steel tanks are also available for corrosion resistant chemical storage. Additionally, DDPS carries a accessories and instrumentation to complement your reactor. Improved CIP efficiency, enhanced heat transfer and mixing, frees up nozzles for other use, reduces shaft deflection and extends seal life by minimizing the bending loads on the agitator shaft.